Glass & Ceramic Artist with an Eye for Form & Function. 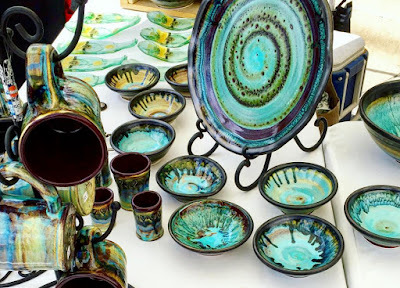 Eye Catching, Cool Colored Glazes From Custom Recipes. Common Creations: Bowls, Platters, Mugs, Shot Glasses, Piggy Banks, etc. Is it just me or are cool colors like Green and Turquoise some of the most eye catching? They draw me in, especially super saturated tones like those used by Austin based ceramics artist Josh Dossett. Muddy Josh, as he's also known, has been active in the arts since a young age, participating in his first show at ten years old! While he's tried a variety of media, he ended up pursing a Fine Arts degree in Glass Blowing and Ceramics. Clay and glass are very different media, but I can see how an artist would be drawn to both. What else can be malleable and durable depending on how it's been treated? With expert training under his belt, Josh found work (and what I assume was priceless mentorship) with several well known glass artists, working on production and installation pieces. In recent years, he has shifted his focus to ceramics, making a variety of functional items out of long lasting earthenware, from platters and bowls to mugs and shot glasses. These pieces all share his characteristic colors which are food safe for everyday use. He worked very hard to develop the perfect glaze recipes to achieve his one-of-a-kind look. Turquoise is often the base color that he then layers with greens, browns and other earth tones. Some are dripped and others swirled almost like they were glazed on a spinning wheel. The resulting patterns are very striking! I love the idea of making a set out of these very different, but all matching pieces! You can find Josh at a variety of shows around Austin. You'll know his work from a mile away thanks to the brilliant turquoises!